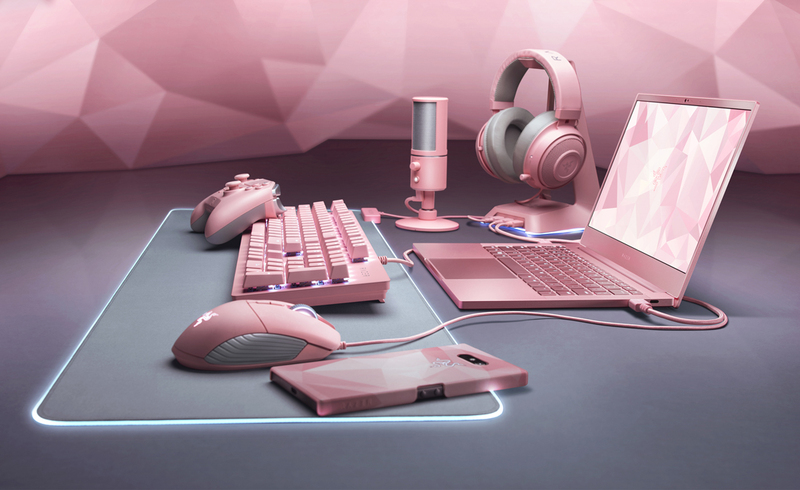 Why it matters: Razer got lots of positive feedback from its first Quartz Pink run - so much so that the company is adding nearly 10 additional products to the limited edition family. Pink may not be everyone's cup of tea but for those that like the colorway, it's nice that the option now exists. Razer has been a frontrunner in the RGB LED movement for years. It’s fitting, then, that the gaming peripheral maker is expanding its Razer Quartz family to include even more hardware… and just in time for Valentine’s Day. On Tuesday, Razer gave eight additional products the Quartz Pink treatment including the Razer Basilisk mouse, the Razer Goliathus Extended Chroma mouse mat, the Razer Huntsman keyboard, the Razer Kraken headset, the Razer Raiju Tournament Edition controller for PS4, the Razer Seiren X microphone, the Razer Base Station Chroma headset stand and the Quartz case for Razer Phone 2. The limited edition colorway was first introduced last year with four products: the Razer Lancehead Tournament Edition mouse, the BlackWidow Tournament Edition Chroma V2 keyboard, the Kraken Pro V2 headset and the Razer Invicta mouse pad. Razer co-founder and CEO Min-Liang Tan said fans told them they could not get enough of their Quartz Pink editions. “We listened and we have given the stunning pink treatment to our latest gaming gear, giving you the unfair advantage in both performance and looks” Tan said. Razer also announced a Quartz Pink edition of its Blade Stealth 13 laptop for US, Canadian and Chinese markets. It goes on sale January 29 starting at $1,599.99.